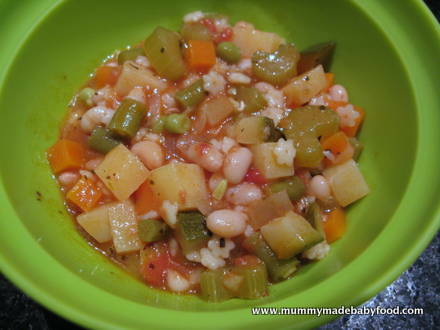 A great baby soup for packing vegetables into your little one is minestrone, a thick soup of Italian origin, is commonly made with beans, onions, celery, carrots, stock and tomatoes. Pasta or rice is often added to minestrone, and whilst it is often thought of as a vegetarian soup, it can contain meat or a meat-based broth. 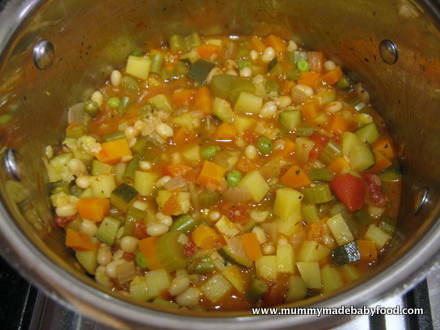 The recipe for minestrone is fluid and varies depending on region, as it is usually made with whatever vegetables are in season. 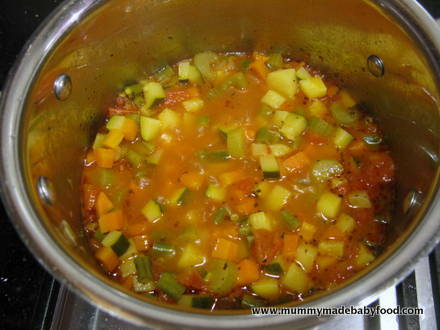 This recipe for Chunky Minestrone Soup contains a wide variety of vegetables, great for adding fibre into your baby's diet. The addition of pasta shapes keeps it interesting for babies while also bulking it out into a filling meal. 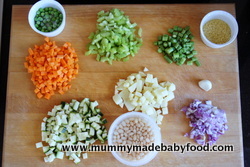 Customise your baby soup by substituting any of the vegetables below for your preferred ones - be creative and take your baby's lead! Although I have used haricot beans in the recipe below, Italian versions of the soup often use Borlotti beans, so feel free to substitute. Dried beans can also be used here, although make sure they are pre-cooked. Heat the oil in a lidded saucepan, add the onion and garlic, and cook for 3-4 minutes and soft and fragrant. 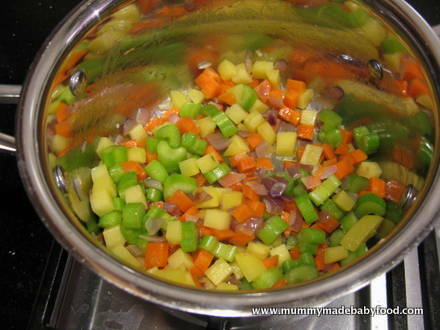 Add the celery, carrots and potato, and cook for a further 5-7 minutes, stirring occasionally. Add the tomatoes, courgette, green beans, basil and stock to the pan, bring to the boil, cover and simmer for about 25 minutes or until the vegetables are tender. Add the beans, peas and pasta shapes, and cook uncovered for a further 10-12 minutes until the pasta is done.